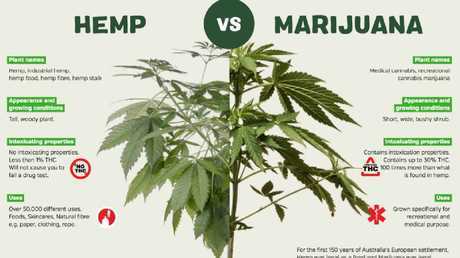 MARIJUANA enthusiasts have spoken of the miraculous effects of their favourite plant for more than 12,000 years, but only now are we beginning to understand the real potential of its powers. You might have accused these pot consumers of becoming deluded by the effects of smoking high-grade bud a few years ago, but countries around the world are beginning to repeal draconian prohibition laws and allowing scientists to finally research the plant - and what they have discovered is incredible. Speaking to news.com.au after Sydney's remarkable CannaTech conference in Sydney - where hundreds of cashed-up entrepreneurs wandered around inspecting the latest weed-growing tech - Paul Benhaim, founder of Hemp Foods Australia, said the plant may contain superpowers which could have a profound impact on our lives. Cannabis researchers speaking at the conference claimed compounds found in the plant could potentially be used to treat a massive variety of ailments from anxiety, depression, migraines and irritable bowel syndrome to acne and even schizophrenia - all without the addiction and liver damage caused by some synthetic treatments. However, you're not going to be magically cured from just smoking a few joints this weekend. Speakers made it clear that cannabis is incredibly complex and extracting the precise components you need to prevent harmful side-effects is still very much a work in progress. Mr Benhaim pointed to research which has emerged over the past two decades which shows we all have something in our body called an endocannabinoid system. This is our body's way of processing and even creating its own cannabinoids - the chemical compounds found in the weed plant. Working alongside our circulatory, respiratory and digestive system, it is argued the endocannabinoid system can impact our appetite, pain modulation, digestion, reproduction, motor learning, stress, and memory. "This has only been discovered in the past few decades and it's incredibly important because it affects the balance and communication between our cells," he said. "It's hardwired into our bodies because it's the master of our balance system - called homeostasis. "This means that if any aspect of your health goes out due to stress your endocannabinoid system immediately responds by modifying your physiology in an attempt to restore homeostasis. "It is one of the most important system in maintaining human health. It is literally bridge between your body and mind." 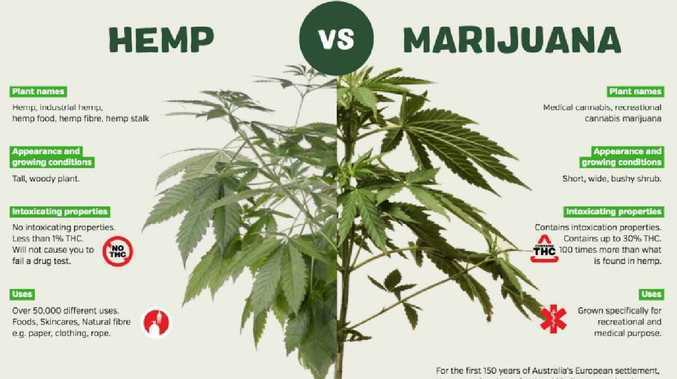 He said people often confuse hemp and cannabis, but they are actually the same plant and parts of it such as hemp seeds - which contain almost none of the intoxicating, psychoactive property THC which makes weed smokers feel stoned - are immensely beneficial to human health. "It's all actually one, plant, cannabis is one single plant and there are many different parts of the plant which you can use for many different uses," he said. "Taking out the water content, your brain is made up of 60 per cent fatty acids - omega 3 and omega 6 and realised hemp seed was a great source of that." He claims we need a constant supply of these fatty acids in our body. But bafflingly, this protein-rich superfood, which can be used in more than 50,000 ways uses from acne treatment to textiles, bioplastics, paper and fuel production - only became legal in Australia less than a year ago. Australia was one of the only places in the world where it was banned. 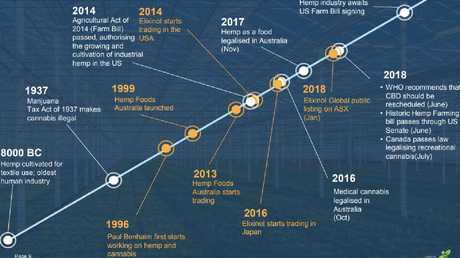 However, the Food Standards Australia New Zealand (FSANZ) approved a proposal to allow the sale of low THC hemp seed foods last year and in April 2017, Australian government ministers responsible for food regulation considered the proposal. At the time, a FSANZ spokesman told SBS: "Our risk assessment found that low-THC hemp seed foods are safe for consumption and can provide a good alternative source of nutrients and polyunsaturated fatty acids, especially Omega-3 fatty acids." Now Mr Benhaim is debating with Aussie pollies in an attempt to make them aware of our endocannabinoid system and the potential health benefits of allowing non-psychoactive forms of weed, such as CBD oil to be made available for Australians. "We know that the endocannabinoid system is active in embryonic stages of human development," he said. "We know that even mother's breast milk contains cannabinoids - but we're still told it's not healthy or safe for you." When he's told this, he simply points to the evidence. United Nations research shows that 180 million people use cannabis globally and only 72 of those died after taking it - contrary to the widespread myth that nobody has died due to weed. However, in the same period alcohol killed 3.3 million of us and tobacco killed 7 million people globally - almost double the population of Sydney every year. And, interestingly researchers in Germany even found that CBD reduces the level of alcohol in our blood. 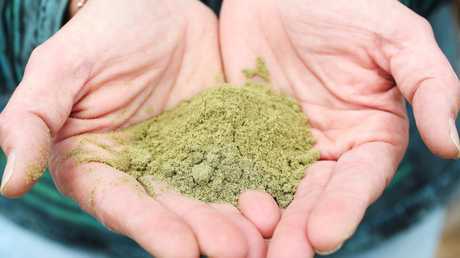 "Synthetic cannabinoids produce frequent, unwanted side effects, which the Australian government always points to this to say we should avoid this," he said. "But the only problems are caused because certain chemical compounds cannot yet be totally isolated." Mr Benhaim added that there's a "very fine line" between recreational and medicinal cannabis use if there's no harm. "We're built for cannabis," he said. "People just need education, but we shouldn't be using it until we're 21 which is when your endocannabinoid system and your brain is fully developed."